I am on a mission to have long and thick hair, like I did when I was a child. It is a slow process but I think I am making some leeway. I used to have such thick, long and healthy hair, but as I have grown up and gotten older it has become thinner and doesn't grow as quickly. I'm in a never ending cycle of having my hair cut, trying to grow it, getting split ends, needing it cut and then it only being a little bit longer than when I first had it cut. It is frustrating, annoying and beyond all else tedious. I swear when I was a child it regrew so quickly and I never had this many split ends, it's like they won't go away. I know using straighteners and curling tongs doesn't exactly help your hair thrive but in 6 months I have probably used those items about 6 or 7 times. Of course I dry my hair every other day, but I am religious with using heat protection and other products. I'm going to try a tip I recently saw on a blog about trying to wash your hair less, which I'm not looking forward to but if it helps... It is a necessary evil. I currently wash my hair every other day, which is better than those who do it every day but it is still too much. If you wash your hair too frequently it takes away all the natural oils and de-nourishes your hair. 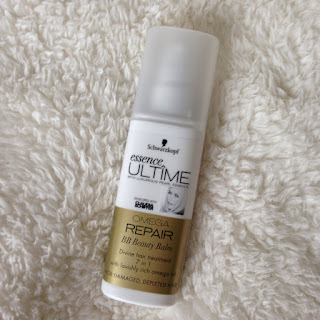 My new resolution is to wash my hair every 3 days to see if that helps it and I have also been using Schwarzkopf Essence Ultime Omega Repair Beauty Balm in my efforts to make my hair stronger. I bought this little gem a while ago and first started using it only on my wet hair. My hair feels so soft, silky and lighter after using it. It made my forget the dryness of my hair and was very nourishing, all while smelling incredible at the same time. I then thought when not apply it to my hair when it is dry as well, see how that turns out. If it made my hair greasy then I would just stick to using it on damp/wet hair but it could also enhance my efforts for better hair. It was a success I am happy to say!! I applied it onto the ends of my hair and a little bit on the body, once my hair absorbed it all I had a nice soft effect and my hair actually looked fresher if that makes any sense. I love this product and am actually really happy with it, it definitely helps damaged hair feel softer and nourished. I mean it's not a miracle cure that will make all your split ends disappear but it will help make your hair feel lighter and less knotty. My hair is more shiny and hydrated, it hasn't cured my problems but it sure is helping to make my hair better.